Coca Cola is encouraging football fans around the world to celebrate with passion and spirit, following the example of Cameroon football legend Roger Milla. The interactive campaign, online at celebrations.coca-cola.com, was sparked off in March 2010 with a commercial focusing on one of football’s most memorable moments, when 1990 FIFA World Cup™ hero, Roger Milla, became the first African player to score a FIFA World-Cup™ goal. 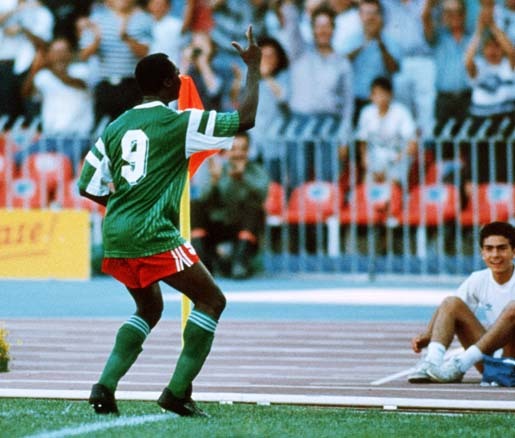 Milla danced his now legendary “Makossa’ or “corner dance” in front of a Coca Cola perimeter board, becoming an icon for players and fans the world over, as well as global ambassador for Coca Cola’s football sponsorship. Fans are invited to upload a video showing their celebratory corner flag dance, and earn the chance to win FIFA 2010 World Cup themed prizes from Coca-Cola. The ‘History of Celebration’ TV commercial features a compilation of international teams and players showing off their celebratory moves, including Brazilian striker Bebeto’s ‘Baby Rocker’, and South African Steven Pienaar with other members of the Bafana Bafana. The Celebration campaign was developed at Santo, Buenos Aires, by general creative directors Maximiliano Anselmo, Pablo Minces, Sebastián Wilhelm, creative director Matías Ballada, art director Maximiliano Anselmo, copywriters Matias Ballada, Pablo Minces, Sebastian Wilhelm, account director Ignacio Diez, agency producer Ezequiel Ortiz. Filming was shot by director Lance Acord via Park Pictures with executive producer Jackie Kelman Bisbee, producer John Bick. S Editor was Angus Wall at Rock Paper Scissors, with producer Kimberly Colen. Sound was mixed at Animal Music by Julián Alonso. Music is “Wavin Flag”, by K’naan. See our article on the song and associated music videos.